Over the last 10 years a cottage industry for Ben Stiller has been his annual MTV Movie Awards skits/mini-movies. He started out putting himself into other people’s films via some amazing cinematic sleight of hand, but he’s since broaden his act by lampooning just about everything to do with the Hollywood hype machine – including a hilarious bit about foley artists. So “Tropic Thunder” which is basically an elaborate MTV skit extended to 107mins, replete with numerous star cameos, celebrity caricatures and even fake trailers (which have been created to absolute perfection), was an inevitable film. Even Tom Cruise who has been a favourite target of his over the years the joins in the fun for a surprisingly robust supporting role. The concept goes like this: Ben Stiller plays Tugg Speedman, an over the hill action star currently filming a big screen Vietnam film. His co-stars include funny man Jeff Portney (Jack Black) who’s famous for his Eddie Murphy-like toilet humour films, and Kirk Lazarus (Robert Downey Jr.), a self-absorbed Australian method actor with five academy awards. When personalities clash on the set, the maniacal military consultant Four Leaf Tayback (Nick Nolte) convinces the director to shoot the remainder of the film in the real warzone of Southeast Asia. When the actors make contact with the Burmese militia they find themselves involved in a full fledged war. Unfortunately Speedman and the bunch are at odds as whether it’s a movie or the real thing. The first half plays like a series of those self-contained skits and celebrity lampooning MTV gags. With much of the comedy going over-the-top early the humour just seemed too far removed from the story. And so the film within a film structure loses shape through a series of logical inconsistencies. In comedy you’re supposed to look past this stuff, but only if the gags score. If they don’t then all the short cuts are painfully obvious. At the 45mins mark I had my doubts, but then the film gets good – really good. As the characters split up into their subplots gradually we’re drawn into the journey and we start caring for the characters – Tayback struggling with his insecurities about his Nam experience, Jeff Portney’s struggle to kick his heroin addiction, and even Matthew McConaughy’s super agent character's effort to get TIVO to his client gets some closure. Of course many of the scenes exist for the sake of the comedy and not the story. Virtually every scene with the irate mogul Les Grossman (Tom Cruise) goes on about twice as long as it should. But considering it's Tom Cruise playing Grossman, the added attention is warranted. Cruise’s performance is not just a cameo but a potentially career saving key supporting role. Cruise is dressed up to the nines as the ultimate Hollywood big shot. His balding head, prosthetically engrossed fingers, arms and chest hair and foul mouth is so over-the–top few actors could possibly get away with it. In cutting the film Stiller obviously recognized how funny Cruise is he gives him a full dance number to roll behind the final credits. Robert Downey Jr. is the real treat in the film though. He carries us through all the slow moments with his sometimes incomprehensible jive talk dialogue and thespian rhetoric. It was a great summer for the man, and either of his Tony Stark or Kirk Lazarus roles could net him some awards nominations. 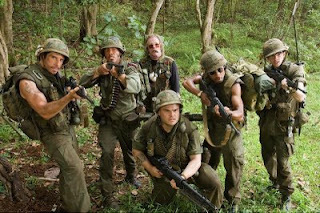 Beyond the spoof humour “Tropic Thunder” is a great action movie. Watch for the action-movie style editing at the end of the film. As the film wraps up its subplots with a series of scenes intercut with an effective emotional rollercoaster style we’re reminded that Ben Stiller is as good a filmmaker as he is a comedian. “Tropic Thunder” is now on DVD and the funny holds up just as well on second viewing. "Tropic Thunder" is available on DVD and Blu-Ray from Paramount Home Entertainment. Any idea where I might find a clip of that foley artists sketch? I've been trying to quote that sketch for so long but my recollection of the bit is deteriorating lately. At this point I can recall the "artists" recording an impromptu theme song for Weekend at Bernie's where they referred to Jonathan Silverman as "the guy from The Single Guy" in the actual lyrics. I dunno..it's a classic, if you find it send me the link! Too funny. I'm looking for that same clip...foley artists from MTV movie awards. Has anyone tracked it down? Help!